It Is What It Is: Holey Cael! It's amazing how you can know someone intimately for four years and simply overlook a common trait about them. And no, this post is not about how I just discovered that Graham is actually a girl, or how Cael has been moonlighting as an exotic dancer after bedtime. This time it was me that had been living under the radar, and Cael finally noticed a very common and noticeable detail as I sat on the couch while the boys played. "What are those shiny things on your ears?" "No, there's a tiny hole so that I can push the earring through." "No, not at all. It stung a little when they pierced the holes, but only for a minute." "Can I see how it goes in?" I took one earring out and showed him how the posts go through my earlobe, thinking that brief tutorial would sufficiently explain to a non-earring-wearer what wearing earrings was all about. For a normal child, perhaps. But Cael is exceptional. Exceptionally strange, that is. "Mommy? Can I get a hole on my finger so that I can wear a penny?" "Uh, I don't think that's a great idea. Your finger would be an ouchy spot to pierce and there's no way to keep the penny on." "Oh, okay. What about my tummy? Yeah, my tummy! I want one on my tummy!" I thought momentarily about explaining how I'd gotten my belly button pierced in college, how it got grossly infected, how I gained weight and it wasn't cute anymore, how I got pregnant with him and how the formerly tiny hole could swallow up a mailbox and how I finally took it out and it closed up. But I wanted him to sleep and not wake up in a cold piercing-induced sweat, so I kept my mouth shut. "On my tummy, I need a hole and then I can put things in there like Cheerios and stickers." "Cael, that's not really how it works. A piercing goes all the way through the skin so that you can put a ring there." "All the way to my back? Wow! I could put train tracks through my tummy to my back. Yeah!" "No, just through a little piece of skin. And some people do it on their tummies, but mostly girls. Plus, you're not getting anything pierced until you're a LOT older, and hopefully not even then." "Mommy I AM gonna get a hole in my skin. But not in my tummy. Maybe in my hair?" This was my chance. I've learned that in cases like this when Cael is overly invested in an idea, it is best to find a way to satisfy him that doesn't force me to give in. I agreed that piercing his hair was a good idea and one that I could do for him right away, and I quickly pretended to punch a hold through his wild and untamed hair. "There you go! What are you going to put in there?" "I want to see!" Cael shouted, running to the bathroom. "No, Mom! It doesn't look any different. I can't see the hole." "Oh, it's there. Should I put a toy in it?" Happy with that suggestion, Cael handed me a drumstick and I poked it through his mane and said, "tada"! I really thought he'd buy it. He was so enthusiastic about the idea that I was genuinely surprised by his reaction. "You've got to be kidding me. This is lame, Mommy." I doubt it's the last time I'll be called "lame" before he's eighteen and goes to college and gets his tummy pierced. "Okay, Mommy. I'm gonna tell you this idea. Ready? This is the idea." "I want to pierce my BOTTOM!" "Yes. I want to pierce my bottom and I can get pretty shiny earrings for my bottom." "I don't think they make earrings for your bottom." "Well then I will put your earrings in the hole and I will hide things in there like poop and toots!" And this would be different from regular life... how? Knowing that my son wants to pierce just about everything and cram my jewelry as well as bodily fluids into all of his original and additional orifices makes me long for the days when he was just a regular four-year-old boy, dancing for money while the rest of us slept. Shawna- I agree! And obviously Cael is in favor. It was funny when I "pierced" his hair, too... he made this tiny little "ouch" sound and then scampered off. I love it! 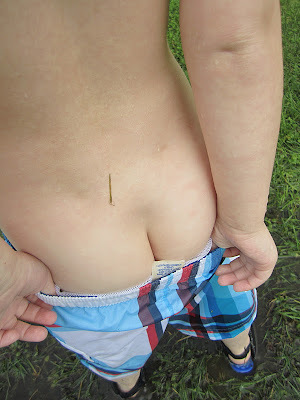 You know there was the SNL skit about the "coin slot" aka the crack of you bottom. Maybe he could keep some thing there without getting any holes. Piercings do hurt at the beginning kind of like a shot, maybe if you tell him this it will deter him. Heidi- That's hilarious! The boys had their flu shots today and we actually just had a conversation about how the shot is much like what a piercing would feel like. He wasn't even dissuaded!